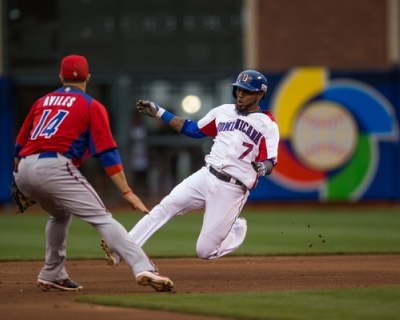 With the conclusion of the 2013 World Baseball Classic, which saw the Dominican Republic winning the title in the championship game over Puerto Rico, the International Baseball Federation (IBAF) has updated its Men’s Baseball World Rankings. With the update the results from the 2013 World Baseball Classic are replacing the results from the 2009 World Baseball Classic in the Men’s Baseball World Rankings. New WBC and IBAF World Champion Dominican Republic made the biggest leap, going from 13 to 7, as the team of manager Tony Pena replaced 55.02 points from 2009 with 300.00 points for winning the title. The Dominican Republic has not been in the top 10 of the year-end rankings since its introduction in 2008. World Baseball Classic runner up Puerto Rico also moved into the top 10 of the Men’s Baseball Ranking, climbing from 12 to 8 (2009: 82.98 points for WBC; 2013: 240.00 points for WBC). At the top of the standings Cuba, USA and Japan maintained their positions. However Cuba and the United States both will lose 250 points during the 2013 season, as tournament results from the 2009 cycle (IBAF Baseball World Cup, IBAF 16U Baseball World Championship) will be taken off in the fall. Chinese Taipei, which already led all teams in points for 2012, moved from 5 to 4 thanks to their qualification for the second round at the 2013 World Baseball Classic. Surprise semi-finalist The Netherlands climbed from 7 to 5, their best position in the Men’s Baseball Rankings since their year-end 5th position in 2011. Canada remains in 6th, followed by the Dominican Republic, Puerto Rico, Korea and Venezuela, which round out the top 10. With Cuba, USA, Dominican Republic, Puerto Rico and Venezuela, COPABE/IBAF America is represented with five countries in the top 10 of the Men’s Baseball Rankings. Korea suffered the biggest drop, losing 184.98 points due to their ninth-place finish at the 2013 WBC. In 2009 Korea had reached the championship game, which they had lost to Japan. Australia moved down from 10 to 13. Italy fell from 9 to 11, even though they improved their point total by reaching the second round for the first time in tournament history. However the Dominican Republic and Puerto Rico did even better and passed them in the rankings, causing Italy to drop. A multiplier is used in awarding points, based on the prestige of the tournament and the quality of the teams involved. The table below reflects the changes in the international baseball schedule recently approved by the IBAF. Below are the multipliers that will be used beginning in 2012. The Thunder Series and Samurai Japan competitions in 2012 were duly sanctioned by the IBAF as per the directive of IBAF Executive, as such, 25 points were awarded per win. Note: only those sanctioned competitions that are solely between NFs “National Teams” will have IBAF rankings implications (that is to say, Cuba vs CPBL will remain only “exhibition” games with no impact on rankings).